A world in the grip of the devil as a result of the overthrow of the Social Reign of Christ the King wrought by the Protestant Revolt and cemented by the rise of Judeo-Masonry and the social revolutions wrought thereafter will degenerate more and more over the course of time. This process of degeneration has accelerated in the past four decades as the flow of graces into souls has been diminished as a result of the liturgical revolution wrought by conciliarism. The fact that baptized Catholics have degenerated into the state of barbarism from which their long ago ancestors in Europe were converted to the true Faith in the First Millennium (and into the early part of the Second Millennium) and have thus plunged headlong into the false attractions of naturalism is attributable to the lack of graces in the counterfeit church of conciliarism and to the worldly, Protestant and Judeo-Masonic spirit of the Novus Ordo service, which reinforces the influence of the world rather than fortifying Catholics to be soldiers in the Army of Christ. Pope Benedict XVI may be the 'rock star' attraction of World Youth Day Sydney 2008 (WYD08), but many headline and emerging artists will also take centre stage during the week. More than 165 outdoor concerts will take place during WYD08 week, 15 - 20 July, as part of the Youth Festival. Headline acts include the likes of Damien Leith, Guy Sebastian, Paulini, the Tap Dogs, Diesel, Vanessa Amorosi and Australian Idol finalist Joseph Gateau. They are joined by some of the world's leading Christian artists, multicultural wonders, eclectic bands and emerging local and international acts. "Dance and song is just some of the ways we can express our faith," said Fr Mark Podesta, WYD08 spokesman. "Apart from the Liturgy, they seem to be the most popular ways for young people with over 165 different acts performing during the week. "WYD08 will be a great celebration, and by the fantastic array of musical genres that will be on stage, there will be something for everybody." The WYD08 Youth Festival will take place from Tuesday 15 July - Sunday 20 July commencing at 2.00pm each day. The Youth Festival will also feature performing arts, visual arts exhibitions, debate, film, national and community gatherings, street performers, workshops and a Vocations Expo. I know, I know. If only the "pope" knew about these travesties beforehand. Do not fear, however! Everything will be made "all right" when he distributes what purports to be Holy Communion on the tongue to those kneeling at an altar rail when he simulates the Novus Ordo service (with the "for you and for all" formula in the alleged words of consecration of the wine into the Most Precious Blood of Our Blessed Lord and Saviour Jesus Christ). The fact hundreds of thousands of young souls will have been exposed to the diabolical horrors of "rock music" and indecency and filth will mean nothing once a few chosen souls from out of the multitude receive what purports to be Holy Communion on the tongue while they are dealing. Sure. I got it. How silly of me to think that the agenda described above is from the devil and is designed to reinforce the ethos of the world in order to lead souls for all eternity, especially since Handel's Messiah is being thrown in for good measure, right? How silly of me. Obviously, there is nothing about which to be shocked here. Conciliarism is apostasy. It has bred these kinds of outrageous displays against modest and decency and reverence in the name of the Catholic Faith as a matter of routine as they are of its (conciliarism's) very nature. While it is interesting to note that there has been no attenuation of these outrages now that the "pontificate" of "restoration" in its fourth year, there is nothing new and nothing terribly shocking about these travesties, which are, of course, simply standard fare in the world of the counterfeit church of conciliarism. Indeed, the more that one is removed from the world of apostasy and betrayal is the more that one can look on these sad spectacles that deceive so many souls as one would look on the events of the upcoming Lambeth Committee meeting of the "worldwide Anglican communion." Both are irrelevant to the Catholic Faith. Events such as "World Youth Day 2008" are merely useful to demonstrate, at least to those who are open to examining the evidence for themselves, that counterfeit church of conciliarism is deadly serious about making its "reconciliations" with the "principles of the new era inaugurated in 1789." Behold the results. Behold the horrors. (kreuz.net) The archbishop of Vienna, Christoph Cardinal Schönborn, has again shown his sympathy for politicians who support abortion. On June 25 he decorated the socialistic deputy mayor of Vienna, Renate Brauner, with the Pontifical Order of St. Gregory the Great. The Order of St. Gregory is the fourth highest award for merits regarding the Roman-Catholic Church. It is directly granted by the Pope and is one of the highest decorations that is conferred on lay people. The award was instituted by pope Gregory XVI. in 1831. The inaugural brief states that it is intended for “gentlemen of proven loyalty to the Holy See” who “are deemed worthy to be honoured by a public expression of esteem on the part of the Holy See”. Renate Brauner was honoured with this order for alleged merits in the field of the Austrian health care system and for her collaboration with ecclesiastical institutions in that field. Brauner is also a well-known defender of abortion which Second Vatican Council has called an “unspeakable crime”. Pro-abortion politicians are excommunicated by Canon Law. “This bestowal of the Order is an expression of the good cooperation between the city of Vienna and the Catholic Church”. In the year 2000, Austrian right-wing politician Herbert Haupt started a move in order to forbid aborting handicapped children after the third month of pregnancy. Current law allows the elimination of disabled children until the beginning of contractions in the mother. This has already been the second time that cardinal Schönborn has bestowed the Order of St. Gregory to a promoter of abortion. In November 2006 he honoured Gertraude Steindl, the secretary general of the ‘Aktion Leben Österreich’ – an Austrian pregnancy centre. ‘Aktion Leben’ is co-financed by the Austrian bishop conference and controversial because of its attitude toward abortion, contraception and abortifacient pills. Renate Brauner is the second pro-abort to be honored by Christoph Schonborn with a "papal" knighthood, and the conference of conciliar "bishops" in Austria co-finances an organization that supports both chemical and surgical baby-killing. Did the "papal" knighthood bestowed by Schonborn upon Gertraude Steindl matter to Joseph Ratzinger/Benedict XVI? Has he upbraided or removed his good friend and protege, Christoph Schonborn? Quite the contrary, Schonborn has done it again, knowing that he acts with complete "papal" approval. What's new here? What's new at all? 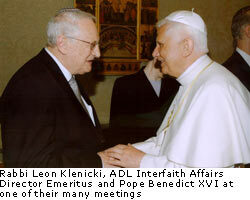 Have I missed the calls for Joseph Ratzinger/Benedict XVI's "resignation" over Leon Klenicki's "papal" knighthood? Why should we be "shocked," therefore, that the City Council of the City of San Francisco, California, passes a resolution denouncing the Catholic Church for opposition to acts in violation of the Sixth and Ninth Commandments when the counterfeit church of of conciliarism exalts the the errors of religious liberty and separation of Church and State and bestow "papal" honors upon people who support the very moral evils of the day that it is "condemned" for opposing? How is it possible to assert that one opposes various moral evils while honoring those who promote them under cover of of law and in every fabric of our popular culture? How is it possible to expect those steeped in unrepentant acts of perversity to respect the authority of what they think, albeit erroneously, to be the Catholic Church when many of the men considered to be its "officials" give a "wink and a nod" constantly to the promotion of evil under cover of law despite all of their opposition to the "dictatorship of relativism?" There is nothing more relativistic that conciliarism's rejection of the very nature of dogmatic truth, which is a rejection of the very nature of God Himself. We must be about the business of shielding ourselves from all of the decaying rot that emanates from the counterfeit church of conciliarism. As has been noted on this site frequently in the past two years, we are grateful for the courage and fidelity of the true bishops and priests who have maintained the Faith and glorified God in the Immemorial Mass of Tradition without making any concessions to conciliarism or to its false shepherds. One will never hear "rock" music or see aboriginal dancing in the true Catholic catacombs, and one will never be confused by the errors of Gallicanism by being told that the Catholic Church could for one moment be in any way responsible for the horrors on full display at "World Youth Day 2008" and that are represented by the repeated "knighting" of those who are, truth be told, just as much enemies of Christ the King and Mary our Immaculate Queen as the conciliarists themselves. May we have the true humility of Our Lady to serve God without complaint and by relying in humility upon her maternal intercession from Heaven as we seek to give to her Divine Son's Most Sacred Heart our prayers and penances and acts of reparation (for our sins and those of the whole world) through her own Sorrowful and Immaculate Heart in this time of apostasy and betrayal, remembering also to have the humble bearing of Saint Camillus de Lellis, whom God had to humiliate before he reformed his life, in seeing the Divine impress in everyone we meet and treating them as we would treat Our Lord Himself. And to truly help others to flee from the errors of the moment and to gain Heaven we must storm Heaven each day with as many Rosaries as our states-in-life permit, imitating little Francisco Marto, who loved to "console the good God" with his Rosaries.